Lauren Cuthbertson in Alice's Adventures in Wonderland. © Johan Persson, courtesy ROH. 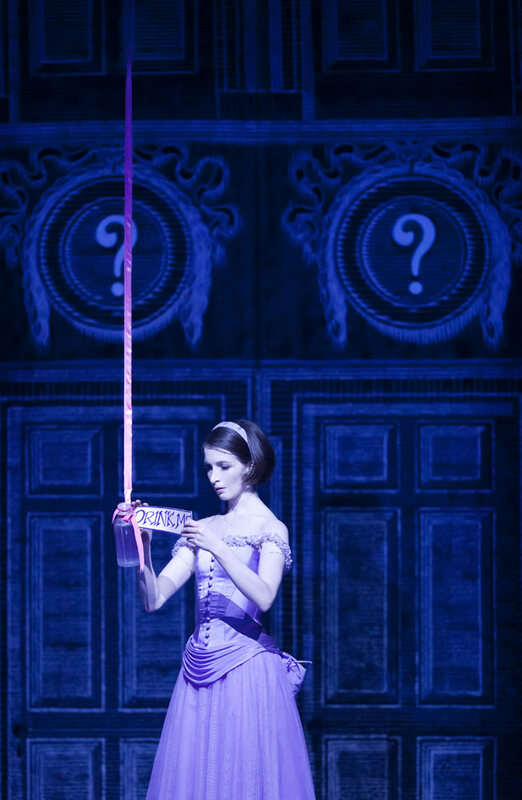 Christopher Wheeldon’s Alice’s Adventures in Wonderland was the big event of the Royal Ballet’s 2010-11 season, the first full-length new work commissioned by the company in fifteen years. Much was riding upon it. It was certainly a box office success, selling out before it opened. But its hectic presentation of the story, fizzing with clever ideas, busy with special effects and dazzling projections, and its brilliantly-coloured designs seemed for some to overshadow the actual dance content itself. Lauren Cuthbertson and Christopher Wheeldon at the curtain call for Alice's Adventures in Wonderland, 2 March 2011. © Dave Morgan. Getting a full-length work right is a major task and for this revival Wheeldon has made a number of tweaks, the most important of which is making it three acts rather than two. Previously the first of two acts had been 70 minutes long: tough on the dancer performing Alice who is hardly offstage but also hard on the attention span, especially for the numerous very young members of the audience. The core concept of the work is unchanged: our Alice is a teenager rather than a young child, and the work begins with Alice and her sisters at a tea party in the gardens of Christchurch in Oxford. All the characters here will form part of Alice’s dream adventure: Alice’s bad-tempered mother will become the Red Queen, the Rajah will become the caterpillar and Lewis Carroll, the photographer, will become the White Rabbit. Alice‘s attraction to Jack the gardener’s boy dismissed by her mother becomes the motor for the plot. Alice’s adventures underground find her in pursuit of Jack, now the Knave of Hearts, seeking to keep him safe from the fury of the Red Queen. Federico Bonelli in Alice's Adventures in Wonderland. © Johan Persson, courtesy ROH. The new material in the work comes in what is now the end of Act 1. The composer, Joby Talbot, has supplied additional music. After Alice has visited the duchess and her deranged cook, Jack enters and the two protagonists get a further chance to dance together, before he flees again as the King and Queen enter. Act 2 now consists of Alice’s encounters with the Mad Hatter and his friends, the caterpillar, and her entry through the previously locked door into the garden she has been seeking. It’s not a huge change but it does make the experience feel a little less hectic and it does bring Alice and Jack together for an additional opportunity for dancing: originally he seemed absent for long stretches. Any ballet which requires a synopsis which spreads over four pages in the programme has its work cut out to get its narrative across in the theatre. Wheeldon gets away with a lot because his audience can be presumed to know the actual Alice story or at least the most familiar characters like the mad hatter or the Cheshire cat. But if some grasp of the narrative can be assumed rather than supplied, Wheeldon still needs to make us care about his characters. He does succeed in making Alice a warm-blooded, strong-willed character, and Lauren Cuthbertson works extremely hard in the role to give us a lively, resourceful and energetic heroine. Jack is less strongly drawn. Federico Bonelli is certainly handsome enough for any teenager to fall for, and a sympathetic partner who dances in a clean and unforced way, but Wheeldon has done little to delineate his character more clearly. The changes Wheeldon has made may not alter many people’s previous perceptions of the work. What may happen is that subtle adjustment in the audience’s views where once something that seemed far too flashy and distracting becomes more accepted. For example the projections of the tunnel down which Alice falls to Wonderland last year seemed much more overwhelming than they did this time. This works both ways however. Some of the costume designs, though they have not changed, register as more irritating and distracting than before. An example is the costumes for the caucus race scene in Act 1. This is the first group dance number in Wonderland and we ought to be enjoying some dancing rather than being distracted by trying to work out what all those strange costumes are supposed to represent. I had been hoping that scene might have been cut in any reshaping, as it seemed one of the weakest elements in the original work. The costumes for the Mad Hatter and his friends are also over bright and over busy. Romany Pajdak as a Flamingo in Alice's Adventures in Wonderland. © Dave Morgan. Some of the production team’s ideas do work brilliantly well, however. The disappearing Cheshire cat and its smile is potentially a nightmare to present on stage. It is presented here by black-clad puppeteers moving around the different pieces of the animal so parts of its anatomy float in all directions. It’s a really simple idea and very effective. 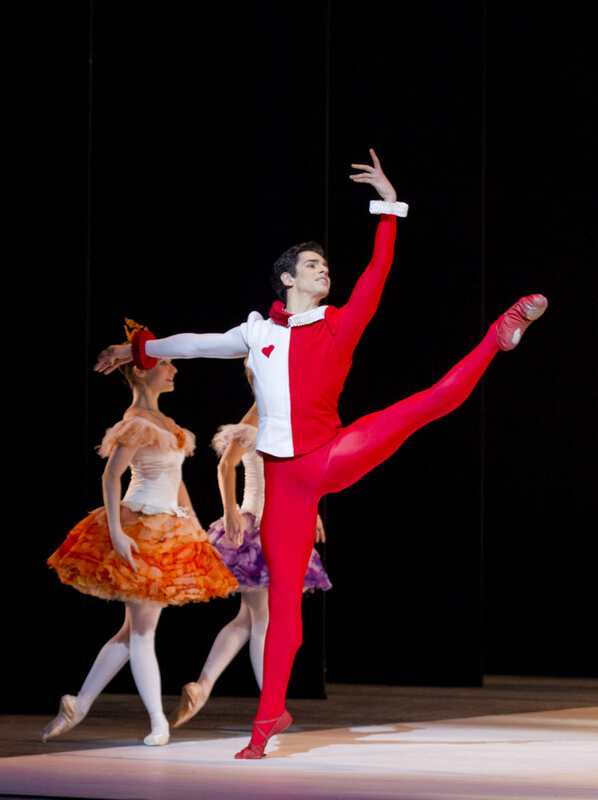 The playing-card costumes for the corps in Act 3, where the tutus are cut in the shapes of hearts, diamonds and so on are very clever, and this act works the most successfully in terms of integrating its dance and design elements. This revival has brought us dancers new to roles. Laura Morera now takes the role of the Red Queen, a chance to go wonderfully over the top and chew every piece of scenery to splinters. She does this with gusto but I did miss the mad gleam in the eyes of Yanowsky, who originated the role, and the jokes that went with Yanowsky’s height in the Rose Adage send up in Act 3. Philip Mosley is seriously scary as the Duchess. Zenaida Yanowsky as the Red Queen in Alice's Adventures in Wonderland. © Johan Persson, courtesy ROH. Barry Wordsworth led the orchestra through Joby Talbot’s score, which works really well for dancing and is full of little details which merit further listening. The run of Alice, like its first, was sold out before it opened. It returns next season. Will Wheeldon make further adjustments? Or will the ROH be happy to leave it as it is and look forward to another full house? Some observations from 24 March, matinee. For all the anticipation around last season’s sell-out, a silence shrouded Christopher Wheeldon’s Alice’s Adventures in Wonderland. Those who did see it were unusually reticent – as though a naked emperor of elephant-sized dimensions were in the room. Subsequently the TV screening did something to disguise its weaknesses. But returning to the show in the theatre, it is a failing clearly evident that playwright Nicholas Wright’s role in creating the scenario did not extend to guiding Wheeldon in dramatic terms. Wheeldon does not know when to leave alone. 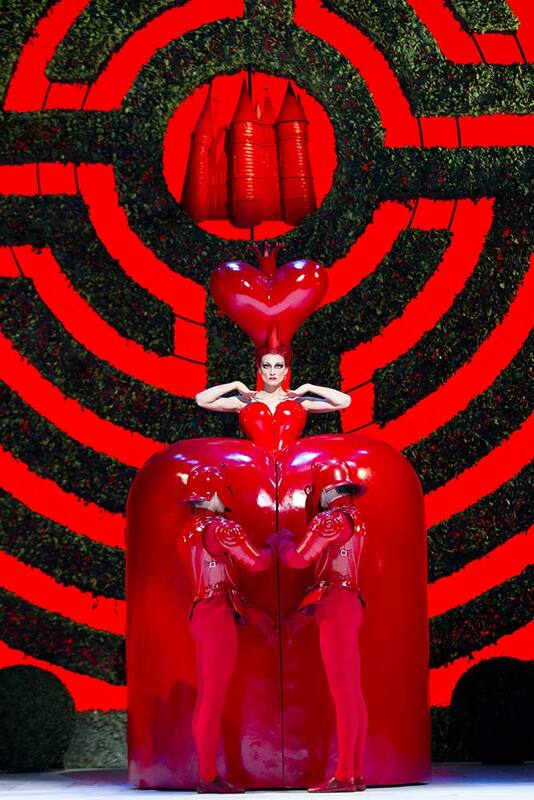 In her armour plating, the red queen’s repeated entrances diminish in impact. The bouncy sponge cake is less amusing the more it is trampolined on. This Alice has a life crowded with incident. The first two acts breathlessly animate as many incidents from Lewis Carroll as possible. Even with so slight a narrative Wheeldon fails to tell a story. The duchess’ kitchen, the Mad Tapper and the evidence giving at the trial are obscurely incoherent. Many scenes outstay their purpose. We are stranded inordinately long outside the doors. Act one would benefit through losing the pool of tears and the caucus race. Wheeldon finds time for many sly references (Alice’s parents have a touch of the Elgars about them, Alice has a Nikiya pose in the scene with the rajah, the playing cards collapse in the way of MacMillan’s Rite of Spring). The third act abandons any attempt at narrative in a spot-the-ballet burlesque. Alice may be the eponymous heroine but there is a gaping hole at the centre where the heart of Alice should be. For all the considerable time this Alice spends gurning through escapades, the choreography reveals little of who she is. She is sidelined in the queen’s garden and the court, like Clara in the kingdom of sweets. However winsomely performed by Beatriz Stix-Brunell we don’t care what happens to her. The ballet begins well. In the Dowtonesque opening scene dance flows naturally out of character. 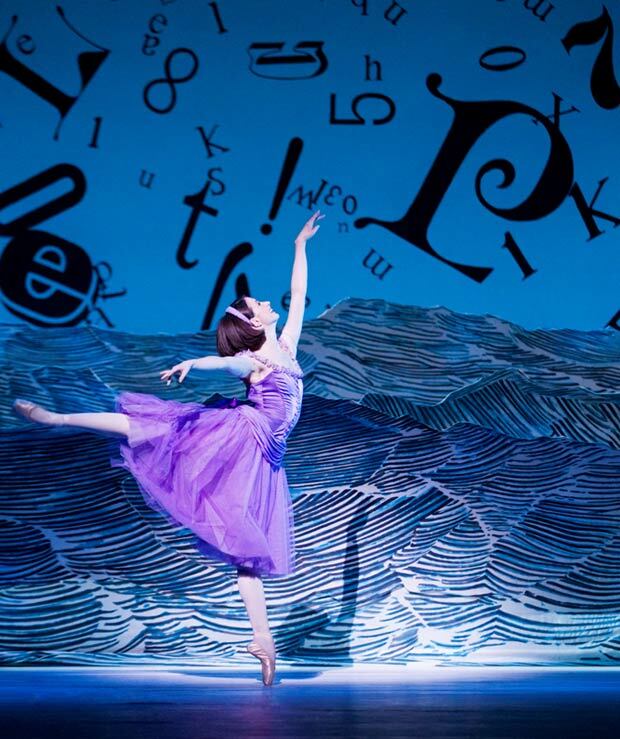 Where Wheeldon later forgets his obligation to Lewis Carroll, as with the waltzing flowers and playing cards, his choreography is pleasant – but only two scenes stand out for their emotional power and expressive use of dance. When Alice dances briefly with her sisters we see three girls yearning for experience. 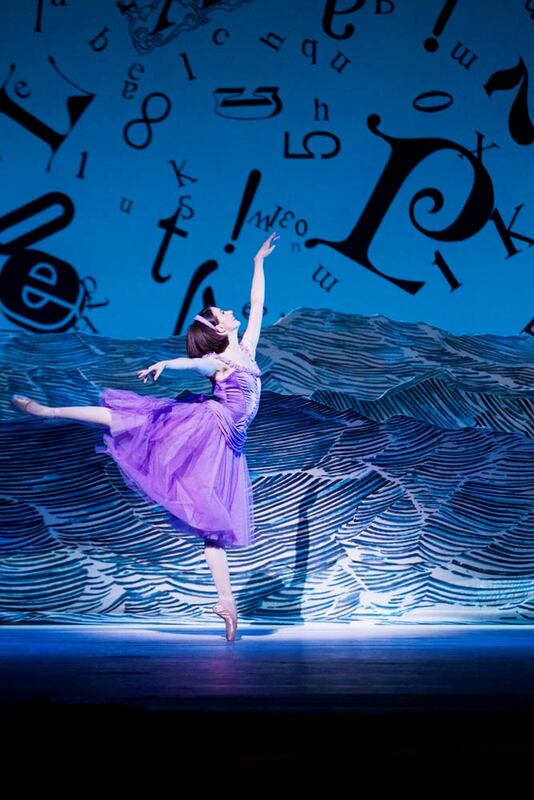 Contemporary Alice and Jack at the ballet’s close are recognisably human and tender. Neither of these moments is mentioned in the synopsis. Otherwise we have a cartoon of grotesques. Sit centrally and Bob Crowley’s sets are joyful. From the sides the view is of a lot of black nothingness. The Cheshire cat captivates, created from the simplest of illusions – and is the only element of Tenniel in Crowley’s designs. You need to be sitting up close to see the beautifully arched feet of the caterpillar – otherwise this is another fabulous costume that swamps the dancers. A good thing, that Wheeldon (unlike a certain other) is making democratic choices in recasting roles, making this a company ballet – but debutant performances were all several sizes too small. Luxury casting, with first soloists as the leading flowers and cards though they were given little to do. Joby Talbot’s score is fabulous – and I hope it will attract other choreographers, not necessarily as an Alice ballet.